While touring together in 2009, musicians of British bands Alestorm and Sorcerer's Spell decided to found a new project. A suitable vocalist was found during an Internet casting session in Thomas Winkler of Swiss metal band Emerald. This took a little time though, so that the first album of their new band Gloryhammer came out only in early 2013. Not unlike their three other bands, Gloryhammer play melodic power metal and are stylistically not that far away from Alestorm. But then I am not really familiar with the other two bands. Tales From The Kingdom Of Fife is a concept album telling a story of medieval Scotland. Where Alestorm's lyrics are mostly about pirates, Gloryhammer are dealing with dragons, witches and wizards. From a musical perspective, the band manages to surprise occasionally, but mostly they are offering well done symphonic metal and furious hymns that don't really offer anything unexpected. A first highlight comes with the upbeat Angus McFife which reminds me strongly of British metal bards Jaldaboath. Amulet Of Justice with its Blind Guardian parallels and the Manowar tinged Hail To Crail are two further really strong moments on the album. Another ear opener is located towards the end with the over ten minutes long The Epic Rage Of Furious Thunder which works as a mini-musical full of a perfect sense of drama and lots of mood changes. All of these better tracks are placed at the album's end, and I wonder how the mediocre patch of three rather insipid tracks in the album's middle could happen. 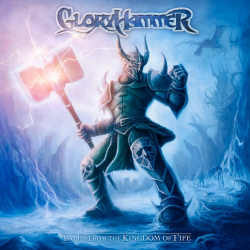 Quest For The Hammer Of Glory suffers from exaggerated keyboard antics, Magic Dragon could have done without its synthetic sounding spinet part, and Silent Tears Of Frozen Princess is a pathetic ballad if there ever was one. Fans of Kamelot and Rhapsody Of Fire might want to check out Gloryhammer. Unlike their role models, Gloryhammer are not yet able to maintain a constant high level. I don't doubt though if they are working steadily on their strengths and banish the keyboards into the background, a better result will definitely possible. After all the involved musicians have without an exception a sufficient amount of experience, and there is also no question about the talent involved.